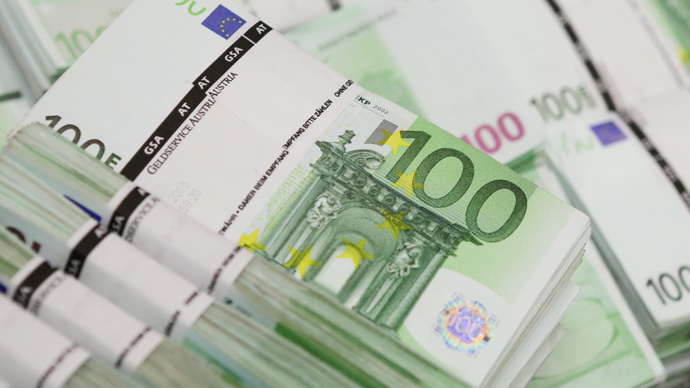 The euro fell to a two-week low on Wednesday following a Greek government warning that it will miss the June 5 IMF payment deadline without a deal with the Troika by then. The single currency traded at $1.1115, down 0.4 percent at 11:36am MSK on Wednesday. It declined 0.71630 against the British pound and 134.34 against the Japanese yen. Greece has to make a €310 million payment to the International Monetary Fund on June 5, but will default if a deal is not reached by then. The country owes more than €320 billion to its external creditors, and is counting on a €7.2 billion International Monetary Fund loan installment. Last week the country raided its International Monetary Fund reserves for a €750 million debt payment to the IMF. The euro was hurt on Tuesday by comments of senior ECB policymaker Benoit Coeure that the lender will accelerate its easy money program in May and June to compensate for lower money supply in the market later in July and August. The euro ended Tuesday’s session down 1.6 percent against the greenback in its largest 1-day loss against US dollar in 2 months. The yield on the 10-year German bund was down 4.8 basis points to 0.603 percent with broadly lower yields across Europe.